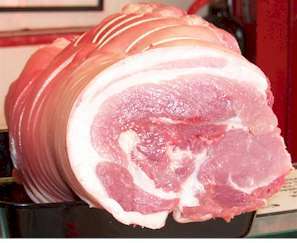 All our pork is Anna’s Happy Trotters Yorkshire free range pork delivered from Howden. It is reared naturally without the use of artificial stimulants. This pork is simply the best flavour and we use only the best when dry curing our bacons and hams. We like our pigs to have a little bit of cover ensuring the pork is juicy and full of flavour. Our meat is delivered in refrigerated vans which keeps the meat fresh and perfect in texture. But the proof is in the pudding, buy this pork once and you will be hooked. Go on give it a try! This makes a great Sunday roast complete with traditional apple sauce. £9.12 per Kg 3 lb. This meat has a little more fat to give extra taste and tenderness. £6.20 per Kg 3 lb. Succulent and tasty to grill, fry or barbeque. £9.12 per Kg 8 oz. This is a really tender cut of Pork. £12.80 per Kg 8 oz. Lean and very tasty pork leg steaks. £10.14 per Kg 8 oz. This pork mince is extra lean and ideal for making burgers and meatballs. This makes a great roasting joint or is good as a substitute for bacon on that traditional Full English Breakfast. £6.00 per Kg 8 oz.